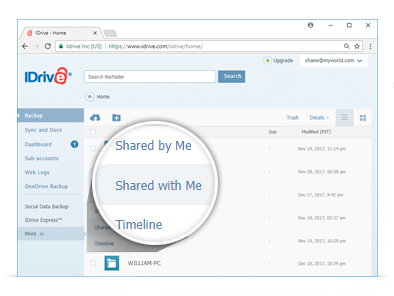 IDrive enables you to quickly and securely share multiple files of any size over Facebook, Twitter and email, under a single link. 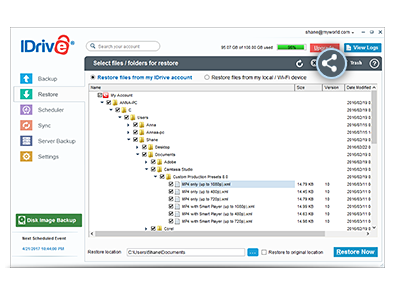 Files from multiple computers and mobile devices, are backed up in the same account, which makes it easy for you to share them. To enhance the security of shared files, you have the option to set a password, so that only authorized people can view the file. 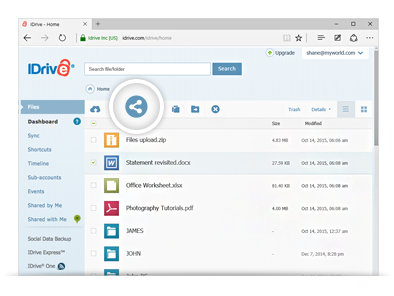 You can collaborate files by giving 'can edit' permission, with which the recipient will be able to make changes to the file and upload them again to your account, or simply share files as 'can view' only. All the files that you have shared can be managed, under the 'Shared by Me' tab. You can share files backed up to your account using any web browser. Login to IDrive.com from any web browser, select the files and click the Share icon. Download and install the desktop application to share files from your computer. Select the files from the Restore tab and click the Share icon. Get the mobile apps for iOS and Android to share files from your mobile device. Login to IDrive Online mobile app, select the files to share and tap on the Share icon. Login to IDrive.com and click the Shared by Me or Shared with Me tab to manage all the files that you’ve shared and the files that are shared with you by other IDrive users!